President Trump approves Nebraska’s expedited request for federal disaster assistance. 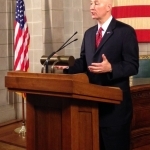 Governor Ricketts submitted the request following devastating flooding and severe weather impacting virtually every region of Nebraska. Governor Ricketts says Nebraskans have already been stepping up to begin the journey to recovering from the most widespread natural disaster in Nebraska’s history. Governor Ricketts says as the state rebuilds, federal assistance is a key part of ensuring that Nebraska remains strong and growing.